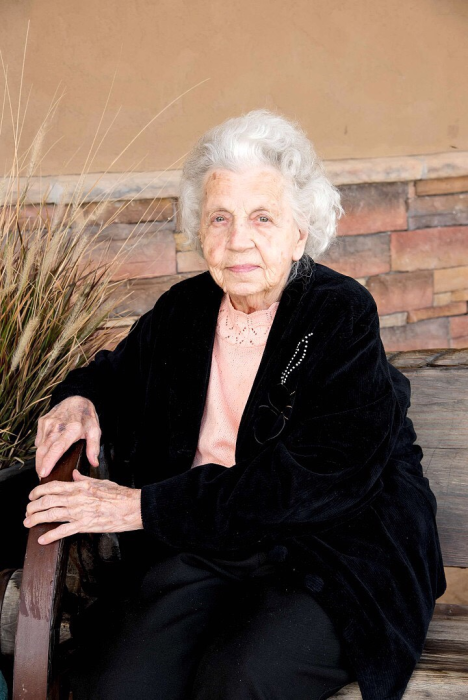 Trula Loretta Kinser Brown was born at home on April 4, 1923 near Speermore, Oklahoma to Bernard Ezra Kinser and Iva Etta Beckwith Kinser and left this life August 14, 2018 at Parkview Pointe Senior Living Center in Laverne, Ok. Trula grew up on the family farm and knew the true meaning of work. The youngest of two children, Trula attended Speermore Union Center Country School through the fifth grade, then graduated from Laverne High School in 1941. While working as a waitress at the Black & White Café in Laverne, Trula met Sterling “Dutch” Spalding Brown. On June 1, 1946, Dutch and Trula were united in marriage in Ashland, Kansas and to that union two children were born Ronnie Lynn, February 9, 1949 and Jolena Ann, December 4, 1952. Trula loved being a wife and mother. She was a dedicated mother, teaching her children to work hard, be honest and treat others with kindness. She was an accomplished seamstress and owned and operated a fabric store in Laverne. She enjoyed camping and fishing with Dutch and playing pitch and dominoes with family and friends. She loved planting and taking care of her flowers and plants. Dutch and Trula spent just shy of 50 married years together. Trula was a devoted wife and she stated, “Dutch was so easy to love”. She was an avid sports fan, cheering on OU, the OKC Thunder and the Laverne Tigers. Special memories her grandchildren shared with Grandma Trula were camping, fishing, seeing her at all of their events, wearing the beautiful clothes that she spent hours making, getting perms, eating her homemade noodles, fried fish, fried potatoes, mac and cheese and snuggling under the electric blankets. Trula resided at Parkview Pointe Senior Living Center in Laverne for almost 5 years. She enjoyed crafts, playing dominoes with residents and taking part in all the activities provided. She loved everyone and everyone loved her. If she ever called you “Sugar Booger” you knew that she thought a lot of you. Trula is preceded in death by her parents Bernard and Iva Kinser, her sister Twila Hicks, special friend Chet Meliza and her beloved husband, Dutch Brown. She is survived by her children Ronnie and wife Sherry of Cushing, Oklahoma and Jolena and husband Gary of Gate, Oklahoma, one brother-in-law, Norvan Brown of Selma, North Carolina, her grandchildren: Gina & Brian Corderman of Enid, OK, Jennifer & Steve Sparks of Laverne, Ok, Julie & Sonny O’Hair of Laverne, OK Lynn Brown of Billings, OK and Matthew & Lisa Graves of Gate, Ok, great-grandchildren: Baylee, Eli, Dalton, Ethan, Ali, Rustin, Tayte, Rhylie, Xander, Keira, Abram, Devri, numerous cousins, nieces, nephews and many friends.